Egyptian women's rights groups and activists are organising a march on Wednesday at 4pm to highlight the issue of sexual harassment and assault in Egypt. 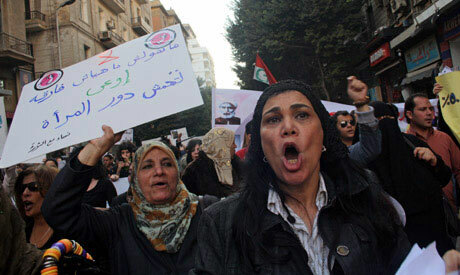 Sexual assaults on women in Tahrir Square are common during large protests and demonstrations, with around 25 being reported on 25 January, the second anniversary of the revolution. Yasmin El-Borhamy, an activist who was sexually assaulted by a gang in Mohamed Mahmoud Street off Tahrir Square, recounted her experiences on private television channel Al-Nahar, saying that a large group of men, some armed with knives, tore off her clothes and sexually assaulted her. The march will take place from Sayyeda Zeinab Mosque to Tahrir Square. Good for you, hope one day Egyptian women can freely walk on the streets at any time at any place without pressure and fear. Just stand for your rights and never give up until you get it. Always wanted to come and visit Egypt but being a women and knowing about sexual harassment there really turn you off and it is a definite loss for the country's economy. Not enough political will to fight back. Setting a new law that would hang rapists in public squares, would not find any objections from the majority. Another point to consider, whoever calls for a protests must pay for a security fee, or design a safety plan for the crowds. It is not moral to entice youth to get out to march, when you know of the probability of rap. The oppositions need to know its supporters before thinking of marching. Instead of millions, filled with thugs and flulell, how about thousands that really care. If there were ever a time for the WOMEN of EGYPT to RISE UP & STAND TOGETHER it's NOW! By removing a woman's clothes and sexually abusing her these MEN prove they're nothing more than IGNORANT SAVAGES that should be Castrated and left to ROT in the DESERT! The women of the world stand by Egyptian Woman and URGE you Not to turn a BLIND EYE! Stop these PIGS before they do this to you or your daughters!